A stock broker is a person whose business is buying and selling of stocks and shares. They are specifically trained to buy and sell of equities for an investor that is their client for a fixed commission. The amount or percentage of these commissions varies, depending on the equity broking firms they belong to. Investment commission is a certain percentange or amount paid to the agent for investments services. Unlike ebay or other market places where people who have products and people who wants to buy the the products assemble to exchange products for cash. 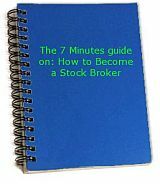 The stock market does not assemble buyers and sellers directly; things are done most of the time through these agents. They execute the mandate of their clients, they can also help you in investment, education, advice and decisions with their analysis skills, they can also be empowered to manage your investment portfolio. Now a days with the advent of internet there are lot of online stock brokers, online banks who are dealing members of the stock exchange and as members of the exchange they are traders. On these online platforms you can manage, buy and sell equities personally or even with the help and advise of your fund manager. So it is the business of buying and selling shares on behalf of investors. But before you can start investing you need to open a brokerage account which allows you to start investing by buying, selling of stocks, bonds, mutual funds. You also have the option of setting up automatic monthly withdrawals, where you can instruct that a specified amount of money be transfered from your checking account to your brokerage account every month.